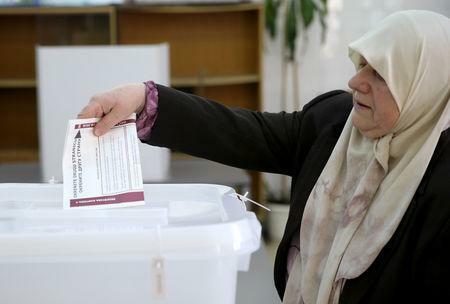 SARAJEVO (Reuters) - Bosnians began voting on Sunday to decide whether their country will pursue a path towards European Union membership and NATO integration or sink deeper into ethnic strife and further fragmentation. 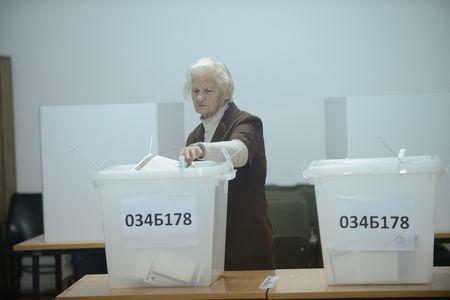 About 3.35 million registered voters were due to take part in the presidential and parliamentary elections, choosing members of Bosnia's tripartite inter-ethnic presidency, consisting of a Bosniak, a Croat and a Serb, and lawmakers for parliament's lower house. They will also select leaders and assemblies of its two autonomous regions - the Serb Republic and the Bosniak-Croat Federation, and of the Federation's 10 cantons. In the run-up to the vote, ethnic leaders spread fear using divisive rhetoric reminiscent of the war. Campaigning has been marked by an unprecedented spate of violations, abuse of public funds and hate speech, monitors said. Polling stations opened at 7 a.m. (0500 GMT) and will close at 7 p.m. (1700 GMT), with the first preliminary results expected at midnight. The election commission said that turnout by 11 a.m (0900 GMT) was 11.4 percent, three percentage points less that at the same time in the last poll in 2014, and that only minor election violations, mainly technical, had been reported. Nearly 7,500 candidates are running for 518 offices in a country of 3.5 million, reflecting a massive and complex government structure based on ethnic quotas, designed under a peace deal that ended the country's 1992-95 war. Experts say Bosnia cannot progress with such a large administration, but any attempts to change the constitution -- an integral part of the U.S.-brokered Dayton peace accords -- have been obstructed by Bosnia's rival ethnic groups. The ruling nationalist parties want to preserve the system of patronage under which an estimated 1 million of their party affiliates are employed at different layers of government, cementing electoral loyalties. "I feel like I am choosing between life and death this time," said Senka Misic, a 65-year-old housewife from Sarajevo. "Unless we make some change, I see no future here for my children and grandchildren." The Serb and Croat presidential candidates, Milorad Dodik and Dragan Covic respectively, who are supported by their respective "parent states" Serbia and Croatia, are set to weaken Bosnia further if elected, analysts say. Pro-Russian Dodik has repeatedly advocated secession of the Serb Republic and integration with Serbia, while Covic has called for the creation of a separate Croat-run region. "If current parties remain in power, a Pandora's box of territorial divisions will open which may lead to disintegration of Bosnia," said Zarko Papic, director of the "Initiative for Better and More Human Inclusion" non-government agency. Dodik on Sunday said he expected a "great victory" that would enable him to do important jobs for the Serb Republic. Covic said he hoped the voters would choose legitimate representatives of Bosnia's three ethnic groups, referring to fears that majority Bosniaks may choose a Croat presidency member from a multi-ethnic and not from a Croat national party. There is a realistic possibility that the formation of the Federation parliament's upper house may be blocked after the Bosniak and Croat parties failed to agree on how to change the election law before the vote. 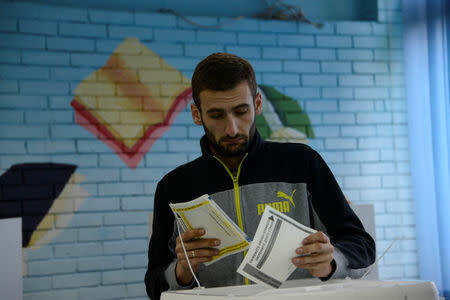 Novo Grujic, who voted in the Serb Republic's de facto capital of Banja Luka, said it was important that as many people as possible cast their ballots to bring about the changes. "The people get a government they choose by themselves," Grujic said.